Preheat oven to 375°. Combine first 8 ingredients (everything except dough and egg) in a medium sized bowl. Mix well. Unroll 1 package of crescent roll dough – do not separate. Arrange longest sides of the dough across the width of a cookie sheet. Repeat with the second package of dough, slightly overlapping the two packages of dough (you are trying to form 1 large piece of dough). Using your fingers, press the edges of the two pieces of dough together. Spread the filling down the middle of the large piece of dough. Using a knife, cut lines 1 ½” apart down both sides of the dough that has not been covered with filling. 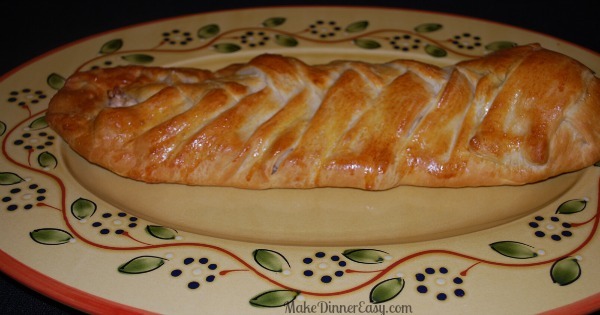 To form a “braid”, start at one end and lift 1 strip of dough from the right side of the chicken mixture and lift it up and half way across the chicken mixture. Repeat with a strip from the left side. When the strips meet in the middle, slightly press and twist them together. Repeat until all strips have been braided together. Brush beaten egg over top (you don’t need to use all of the egg, just enough to slightly coat the braid). Bake 25-28 minutes or until golden brown. Cut into 1 ½” slices and serve. 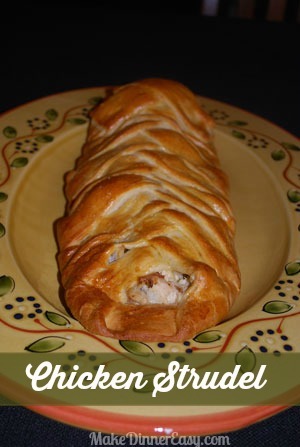 My friend Teri gave me this recipe for chicken and broccoli strudel years ago and I have made it often. For ease of preparation it does use a packaged dough but you could certainly make your own if desired. If I'm serving this to company, I assemble the strudel on a parchment paper lined cookie sheet before everyone arrives and refrigerate. I also have the beaten egg in a cup in the refrigerator. Then, prior to baking it is easy to bush the egg over the strudel and bake. This is one of those "impress your friends" kind of recipes. It looks and tastes great but it's really not that hard to assemble. To make it even easier for you, I have a few assembly photos on the right!